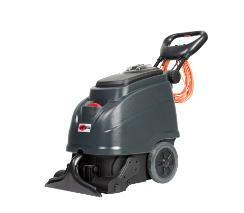 The VIPER CEX410 is a professional self-contained and silent carpet extractor. With its excellent cleaning performance, you can maintain textiles like carpets and upholstery in an efficient and easy way, the powerful vacuum motor ensures fast dry-time. The machine is equipped with large capacity tanks; 35L solution and 23L recovery made of ridged, chemical resistant and environmentally friendly polyethylene. The handle can easily be adjusted for different operator heights to obtain an ergonomic working position.